With so many different types of insulation available for residential use, selecting the right one for your home may seem like a daunting process. You’ll need to consider your budget, the durability of the insulation and the R-value, which is the measurement of thermal resistance or the capacity of an insulating material to resist heat flow. The “R” stands for “resistance”. The higher the “R”, the greater the resistance. In addition, you’ll want to take into account the environmental friendliness and the safety of different types of insulation before making your final decision. Let’s explore some popular options. This type of insulation is the easiest to install and is usually the least expensive. It comes in either large rolls or pre-cut strips that are gently pressed into place or it can be blown-in. The rolled fiberglass batts are available in different thicknesses and densities to provide the desired R-value. This type of insulation works by trapping air between the fibers of the fiberglass. Rolled Fiberglass is inexpensive, but for even better R-values, consider blown-in fiberglass insulation which is commonly used in hard to reach places such as attics and crawl spaces. Fiberglass is made from melted sand and recycled glass, so it’s environmentally friendly. 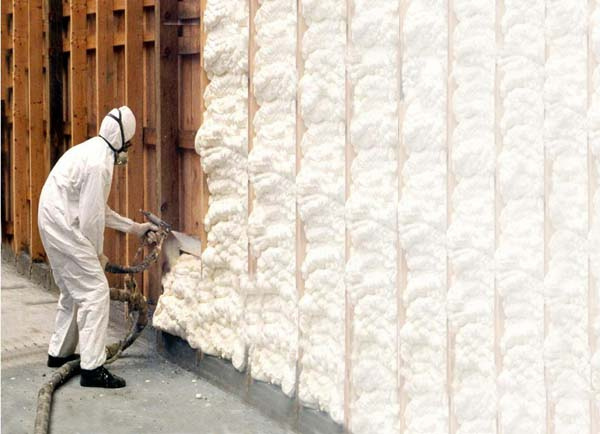 Batt insulation is held together with a binder, and most brands use a formaldehyde-free binder. Loose-fill fiberglass does not have a binder. Foam board insulation is made of the same type of foam as the cups or plates you may drink or eat from (polystyrene), or it can be made from polyisocyanurate (polyiso). The white foam board is usually called “bead board” and has a relatively low R value. Polyiso board has a better R value but costs more. . Foam board insulation comes in sheets measuring 4 feet by 8 feet and can be cut to size with a utility knife. This type of insulation is ideal for use along the walls of a concrete foundation or basement to reduce air leaks in the lower level of a home. Foam board is affordable, but is not as effective as other methods. This type of insulation is installed by blowing it into the walls or ceilings where it is needed. It is usually made from recycled newspaper materials treated with boric acid or other similar chemicals as a fire retardant. It’s an environmentally friendly choice, but in addition to being a mostly recycled product, cellulose blown-in insulation resists insects, rodents and mold and forms a good sound barrier. It is also commonly used in difficult areas to reach. The advantage of spray foam insulation is that it expands as it dries. The expansion allows the spray foam to form a more complete seal that reduces the infiltration of humidity, heat and air drafts. Spray foam is made from polyurethane and can release fumes during the installation process. This option is highly effective and must be installed by experienced insulation contractors. There are a lot of choices when it comes to insulation. To work with a professional service that can share the pros and cons of each method, contact USI online to request a free quote. USI believes that excellence in every step of the process ensures timely completion and quality service, time after time.